GIMMICK UNIT03 LED SWORD BLUE Ver. Laser sword that actually emits light from the MSG gimmick unit series appears! Dramatic production that shines brilliantly with Millite (Lithium battery with LED) is possible. The sword part comes with two kinds of shapes, things with satin finished surface and ordinary things. The color ring is a set of clear color molding Ver. And colorless clear Ver. According to the light emitting color of the LED. 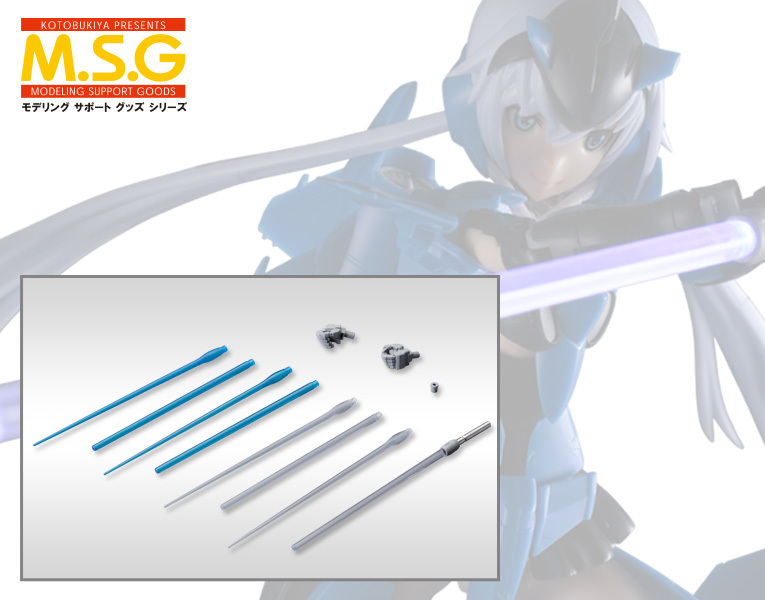 Colorless clear molded sword parts that become optional parts are for paint fashion modelers and can be used freely. Furthermore, a special wrist part corresponding to a frame arm corresponding to grip of LED sword is attached. You can enjoy action pause with Keren taste with angle attached to wrist. ※ The LED sword is using the LED with lithium battery specifications, battery life in each color is different. Please note. Lit when you try to push the saber parts while holding the grip parts . ■ When it turns off, it will go out when pulling the generator parts while holding the grip parts. ■ The sword parts are selectable from 2 types, and you can choose from A specification with a rounded tip, B specification with a sharp tip. ■ The attachment part has a hole diameter of 1.5 mm and can be used freely by processing with pinvis etc. according to the application. ■ If you use a special wrist part corresponding to the frame arm, you can also use it for frame arm. ■ The diameter of the grip part is about 3 mm and it is very compact so you can use it for remodeling various plastic models.